Many glass melting furnaces, glass slumping and forming kilns, annealing lehrs and glass flash kilns are fired with burners from Australian Combustion Services. Follow this link for detailed information on the burners and controls that are used. 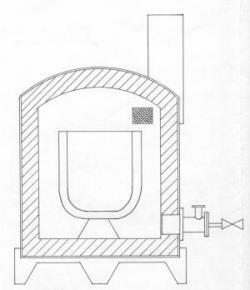 Low temperature ovens such as annealers and slumpers are fired with tube burners or kiln burners. Higher temperature furnaces can be fired with atmospheric kiln burners provided the combustion space is adequate, the gas pressure high and the process efficient. Better results are obtained using burners that use forced air for faster combustion. Glory holes should use forced air burners. Click here to return to the General Site Index.